We brought it home, put the glass in the garage and piled the rest out back on cardboard. It came with four sturdy tables with wooden slat bottoms. Perfect for starting seeds or filling with leafy green. It also came with a pack of pictures showing how to construct it. 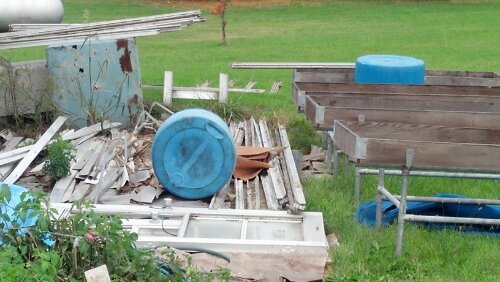 It was a professional grade greenhouse that used to be at a local flower shop in our hometown. When we finally got around to getting the underground wires and cables marked by JULIE and determining where we were going to put it, we quickly realized that this was going to be a MUCH bigger project than we had anticipated. The slope of the land would have to be evened out. We would need to construct some sort of a base to keep the greenhouse from blowing over with the high winter and summer winds, and on, and on. The amount of money and time it would take kept growing and growing. 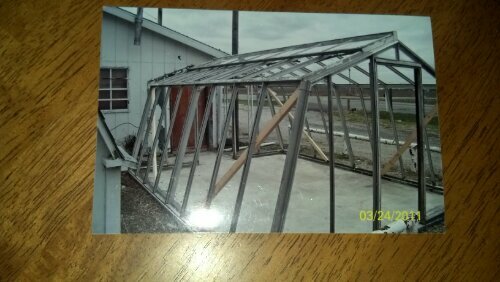 After a long and painful chat, we decided to cut our losses, sell the pieces for scrap, advertise the glass on Craigslist and build a garden shed with plans to add a greenhouse later. We were going to keep the tables, so it was not a total loss. Neither one of us felt very good about this decision. Wasn’t there some way we could use the materials? Couldn’t we find some use for the glass? Ah, cold frames! Of course! Why didn’t I think of that? Cold frames are perfect mini greenhouses for growing leafy greens, broccoli, cabbage and other cold weather hardy veggies. This is exactly why we wanted the greenhouse up this year. Now, instead of feeling bad about selling our jigsaw puzzle of a greenhouse at a loss, we felt great about adjusting our plan and creating several mini greenhouses from the parts. I had forgotten that a plan can always be adjusted, and sometimes…turn out even better than the original. In true Ray and Lissa style…always making something work even better than it was supposed to work in the first place. I had almost forgotten about the jigsaw greenhouse we bought in 2012 only to sell the parts in 2013. Now we are working on building a hoophouse style greenhouse…for real this time. It’s sounds similar to revising a manuscript – getting rid of the useless pieces and rebuilding what’s left to make it better! Wow! I had not thought of revising that way. Sheds a whole new light!